A veteran of the U.S. Navy, McCandless began his NASA career in 1966 and held several positions before his spaceflight career launched aboard the Space Shuttle Challenger in 1985. During the historic Apollo 11 mission, Bruce served as CAPCOM, meaning he was responsible for all communications between Mission Control (Houston) and the Apollo 11 astronauts: Neil Armstrong, Buzz Aldrin, and Michael Collins. In addition to his CAPCOM role, McCandless was part of the astronaut support crew for Apollo 14, served as the backup pilot for the first manned Skylab mission, co-investigator on the M-509 astronaut maneuvering unit experiment (Skylab), and worked on the development of the manned maneuvering unit (MMU) used during shuttle spacewalks (EVAs). McCandless helped with crew inputs for hardware and procedural developments of the Inertial Upper Stage (IUS), Space Telescope, Solar Maximum Repair Mission, and the Space Station Program. 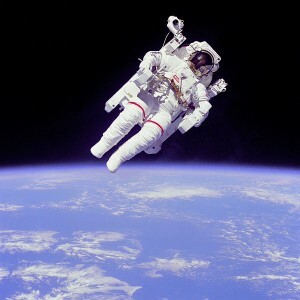 Bruce logged over 312 hours in space including four hours as part of the first untethered spacewalk with the help of the MMU. He served as a Mission Specialist for two shuttle missions – STS-41B and STS-31. Kennedy Space Center annual passholders were in for a real treat on Sunday as they had the opportunity to participate in a special guided tour of the Saturn V Center by Bruce McCandless. The tour started off with a stop in the center’s Apollo 8 Firing Room, where the actual launch control consoles from the Apollo program are displayed. Visitors viewed three screens of original news clips from early NASA and footage from the Apollo 8 mission. The doors then opened to the Saturn V room, where a fully restored Saturn V rocket is housed; one of only three still in existence. The Saturn V was the most powerful rocket ever built and stood 363-feet tall. 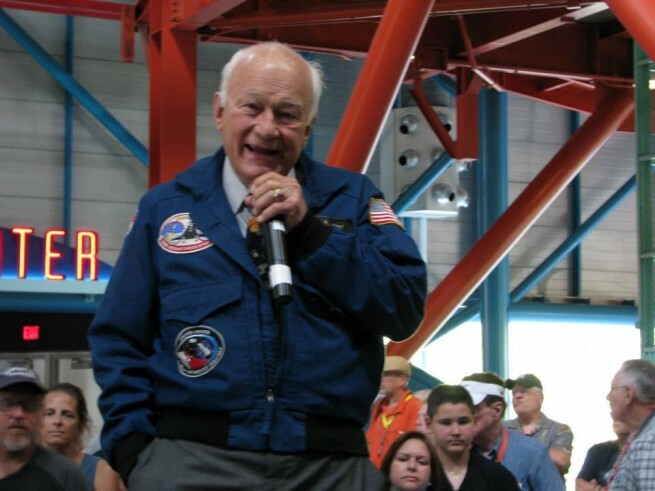 McCandless spoke at each of the rocket’s different stages, lecturing the audience on the rockets components as well as the lunar lander and the lunar rover (“moon buggy”). Guests were then directed to the lunar theater where they could view a reenactment of the Apollo 11 lunar landing. Afterwards, guests and Bruce ventured into the Apollo Treasures Gallery where they could view “treasures” from the Apollo era such as Apollo 14 Commander, Alan Shepard’s spacesuit and command module, Kitty Hawk. 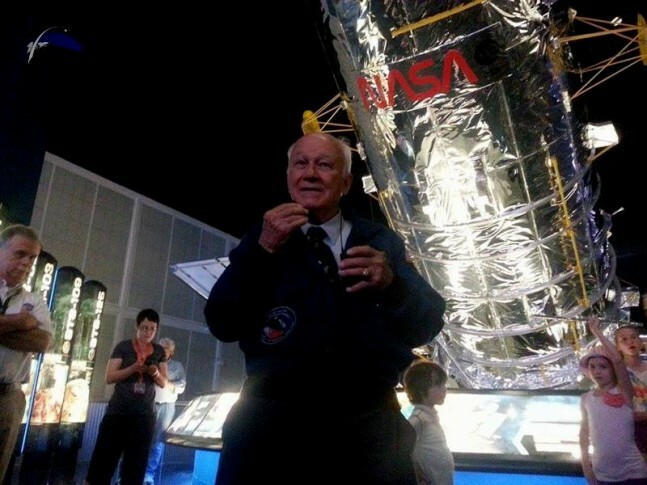 The Apollo anniversary celebration continued at the Space Shuttle Atlantis exhibit where Bruce took some time to answer audience questions about the Apollo program and the famed mission. Later in the afternoon, Bruce McCandless was joined by Jack Lousma for a viewing of the historic lunar landing at the very time Neil and Buzz touched down 45 years ago. He went on to express his disappointment that we haven’t been back since Apollo 17. Jack Lousma joked with Bruce saying he had a lot more luck as CAPCOM with the Apollo 11 crew than he did with the Apollo 13 crew. He went on to say, “it was because of the early NASA astronauts that I applied to NASA’s astronaut program and felt the Apollo program was going to be important to the country and to the world. I couldn’t be happier to be part of it. The Apollo 11 mission touched down on the lunar surface at 4:17 pm EDT on (20:17 GMT) July 20, 1969. Excellent article Amy, I wish I could have been there. When I was fortunate to meet Col. Lousma at the Yankee Air Force Museum here in Michigan, I asked him, “Colonel, do you think that we should return to the Moon?”, he replied, “Definitely, only this time we should stay!” He is a GREAT GUY! Thanks Karol! It was such an amazing experience just to be able to hear them talk. 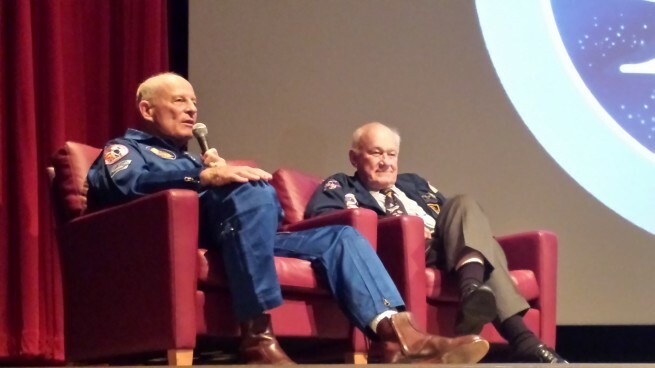 I could listen to astronaut stories all day. How wonderful you were able to meet him. McCandless, Duke and all Apollo capcoms deserve a very special recognition as those who brought the Apollo missions to the world community through their clear, concise communication. Let’s not forget their important contributions to these historic events.